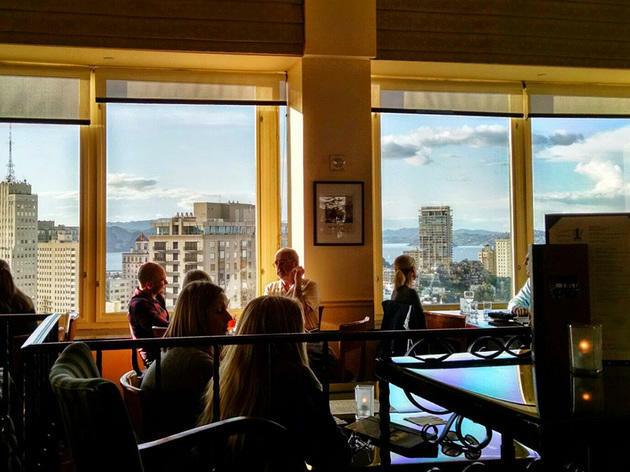 Originally opened in 1939, the Top of the Mark is a stately, storied bar. It was once a tradition for U.S. Navy officers to belly up for a send-off drink before shipping out during World War II. (The northwest corner, dubbed the “Weepers’ Corner,” is where their girlfriends would watch the ships depart the bay.) The vibe has changed significantly since then—Solange Knowles dropped in to DJ the bar’s 75th anniversary party—but the sweeping view remains, encompassing the Financial District, Bay Bridge, Chinatown, North Beach and Golden Gate Bridge. Though the menu offers more than 100 variations on the martini, you’re best sticking with classics. Bands play live music several nights a week; check the online calendar for details. 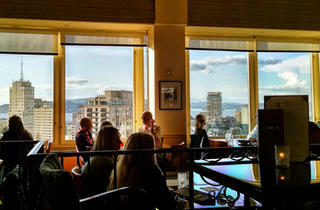 Beautiful views from this glass-surrounded bar at the top of a hotel. Drinks were good (but expensive), and service was good too. Beautiful views.